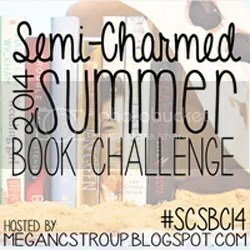 I am going to start telling you all about Vienna soon, but right now it’s the start of a new month and time to check in with the Summer 2014 Book Challenge over at Semi-Charmed Kind of Life. I’ve been useless at writing reviews recently, but I have been reading and I’ve managed to complete another four categories of the challenge. As a reminder, here is my check-in post from last month: The Summer Reading Challenge: Month 1 when I completed 5 categories for 90 points. The Night She Disappeared by April Henry– 229 pages. I have no idea how I came across this book, but I’m glad I did. I do want to write a proper review on it, so I won’t say too much here, but basically it’s a young adult mystery/thriller/crime novel. Having swapped shifts with co-worker Gabie, Kayla goes out to deliver a pizza and never comes back. When Gabie finds out that the caller originally asked for her, she’s plagued with guilt and, convinced Kayla is still alive, becomes determined to find her. I really enjoyed this book and though April Henry did an excellent job of getting inside the teenage characters’ minds. The various emotions they went through (guilt, fear, etc.) all rang true. You even got the occasional glimpse into the kidnapper’s thoughts, which was pretty creepy. This was a short read, but a good one. I’m just sorry it wasn’t around when I was a teenager! 5 stars (rating books is difficult! I really want to give it 4.5, so I’m rounding it up…). The way everyone’s been raving about it, I expected to love this book, but I’m afraid I didn’t. I liked it, I read it all in one sitting and, of course, I cried…. but nowhere near as much as I was expecting to. I cried a lot more at P.S. I Love You! I did like Hazel. She was occasionally mean, argued with her parents, and you could feel her desire to be a normal teenager shining through. Gus, on the other hand, was way too perfect. Always knowing exactly what to do and say in every situation. He just didn’t feel real to me, and I couldn’t identify with him (okay, I’ve never had cancer, but I have been a teenager and I have been in love… I should have been able to relate to him on some level). It’s still a good book, but despite what everyone else thinks I’m afraid, for me, it just isn’t a great book. 3 stars. Peony in Love by Lisa See – 387 pages. I LOVED Snowflower and the Secret Fan by the same author, so I was really excited to read this book. Sadly I ended up being very, very disappointed. I am planning to write a full review of this one at some point so I won’t say much here, but let’s just say it wasn’t at all what I was expecting. I wanted to get an insight into Chinese history and customs (as I had from the other book), instead I got a few glimpses into Chinese culture but mostly a weird teen love story. 2 stars for this one. 15 points: Read a book another blogger has read for the challenge. Bedknobs and Broomsticks by Mary Norton – 189 pages. There were a few books other partcipants had read that I found interesting, so I decided to order a few and see which arrived first… this one was the winner. The copy I read was actually a compilation of two books: The Magic Bedknob and Bonfires and Broomsticks. The first omnibus edition (released in 1967) was called Bed-Knob and Broomstick, but I got the newer copy which was named after the Disney Film. Before I saw this title on the first check on for the challenge, I had no idea that the Disney film was based on a book… let alone one by the author of The Borrowers, one of my childhood favourites! I got very excited and had to order a copy straight away. The book is actually completely different to the film, and this is one of very few instances where I actually liked the film better (although it’s an unfair comparison because the only things the film seems to have taken from the book are the idea of three children meeting a witch and getting an enchanted bedknob that then causes their bed to fly). The war effort is a big theme in the film, whereas it isn’t even mentioned in the book. The children do wonder at one point whether it would be fair to use magic in wartime, and Carey (the eldest) has the idea that magic could be used to help with the war, but is promptly shushed with a warning about everything that could go wrong (“imagine if all the soldiers were turned to white mice!”). Generally, the book is a bit of a mixed bag. There are some good parts, but the first book seems to end rather suddenly before it really gets going. I would have liked one more adventure! It is a children’s book though, so maybe the author was thinking of short attention spans. There’s more action in the second book, and a bit of a gentle history lesson 😉 Overall, this a fun little read with some interesting characters (I liked everyone but Charles, the middle child, who was boring and a bit flat – probably because his sister and brother got all the good lines – Paul was the only one who could work the magic bedknob and Carey makes all the decisions and isn’t afraid to stand up to the adults in the book). I think I would have liked it better if I’d actually read it as a child though… the “scary bits” just aren’t as scary when you’re in your 30s! Also, this book was published before The Borrowers (1943/1945 for the Bedknobs books vs. 1952 for The Borrowers) and I would venture to say that Mary Norton’s writing improved somewhat in that time. From what I remember, The Borrower’s was better written. I’ll still give this one 4 stars though. If you’re interested, here’s the review by the blogger who inspired me to read this book (click on the purple writing). So, that’s 50 points for month two of the challenge. Added to last month’s 90, that makes a total of 140 points. I still have 3 categories to complete: A book I failed to finish the first time I read it, a book by a blogger (I’m waiting for this one to arrive) and a biography/autobiography/memoir (I’m almost finished! ).